Since the Pi Zero was released, there have been many attempts to add a power bank. Cell phone batteries are about the same size as a Pi Zero, after all, and adding a USB charging port and soldering a few wires to a Pi is easy. The PiSugar is perhaps the cutest battery pack we’ve seen for the Pi Zero, and it comes in a variety of Hats compatible with the Pi, capable of becoming a small display, a keyboard, or any other thing where a small, portable Linux machine is useful. The core of this build is a small circuit board the size of a Pi Zero. Attached to this board is a 900mAh battery, and the entire assembly is attached to the Pi Zero with a set of two spring clips that match up with with a pair of pads on the back of the Pi. Screw both of these boards together, and you have a perfect, cableless solution to adding power to a Pi Zero. But the PiSugar doesn’t stop there. There are also cases, for a 1.3 inch LCD top, a 2.13 inch ePaper display, an OLED display, a camera, a 4G module, and something that just presents the pins from the Pi GPIO header. This is an entire platform, and if you print these parts in white plastic, they look like tiny little sugar cubes filled to the brim with electronics and Linux goodness. Yes, you’ve seen 3D printed Pi cases before, but nothing in the way of an entire platform that gives you a Pi Zero in an extensible platform that can fit in your pocket and looks like sweet, sweet cubes of sucrose. Thermal cameras are one of those tools that we all want, but just can’t justify actually buying. You don’t really know what you would do with one, and when even the cheap ones are a couple hundred dollars, it’s a bit out of the impulse buy territory. So you just keeping waiting and hoping that eventually they’ll drop to the price that you can actually own one yourself. Well, today might be the day you were waiting for. While it might not be the prettiest build, we think you’ll agree it can’t get much easier than what [vvkuryshev] has put together. 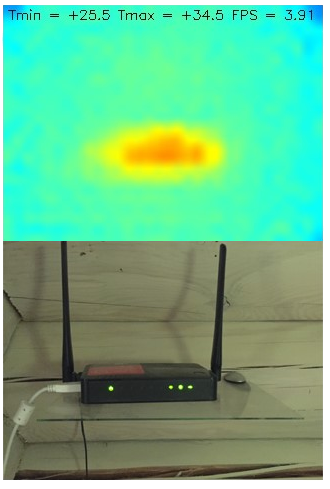 His build only has two components: a Raspberry Pi and a thermal camera module he picked up online for about $80 USD. There isn’t even any wiring involved, the camera fits right on the Pi’s GPIO header. Of course, you probably wouldn’t be seeing this on Hackaday if all he had to do was just buy a module and solder it to the Pi’s header. As with most cheap imported gadgets, the GY-MCU90640 module that [vvkuryshev] bought came with some crusty Windows software which wasn’t going to do him much good on the Raspberry Pi. But after going back and forth a bit with the seller, he was able to get some documentation for the device that put him on the right track to writing a Python script which got it working under Linux. 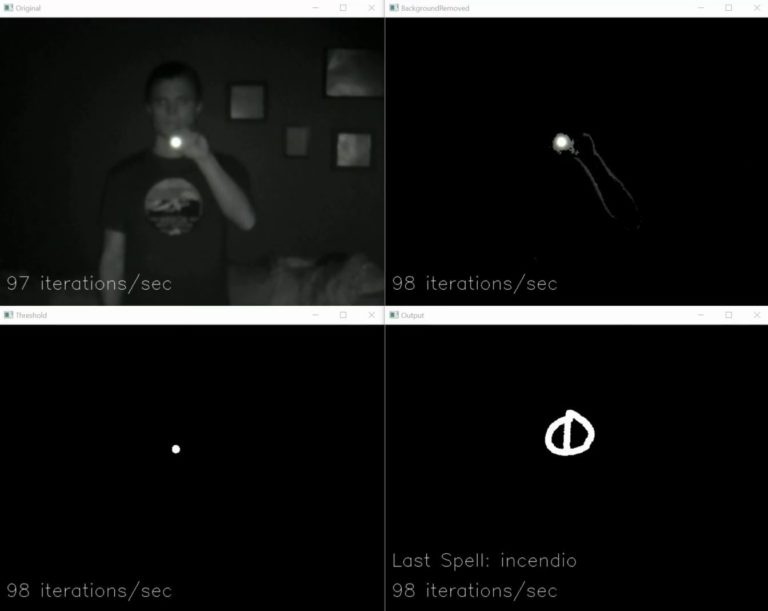 The surprisingly simple Python script reads a frame from the camera four times a second over serial and run it through OpenCV. It even adds some useful data like the minimum and maximum temperatures in the frame to the top of the image. Normally the script would output to the Pi’s primary display, but if you want to use it remotely, [vvkuryshev] says he’s had pretty good luck running it over VNC. In fact, he says that with a VNC application on your phone you could even use this setup on the go, though the setup is a bit awkward for that in its current incarnation. 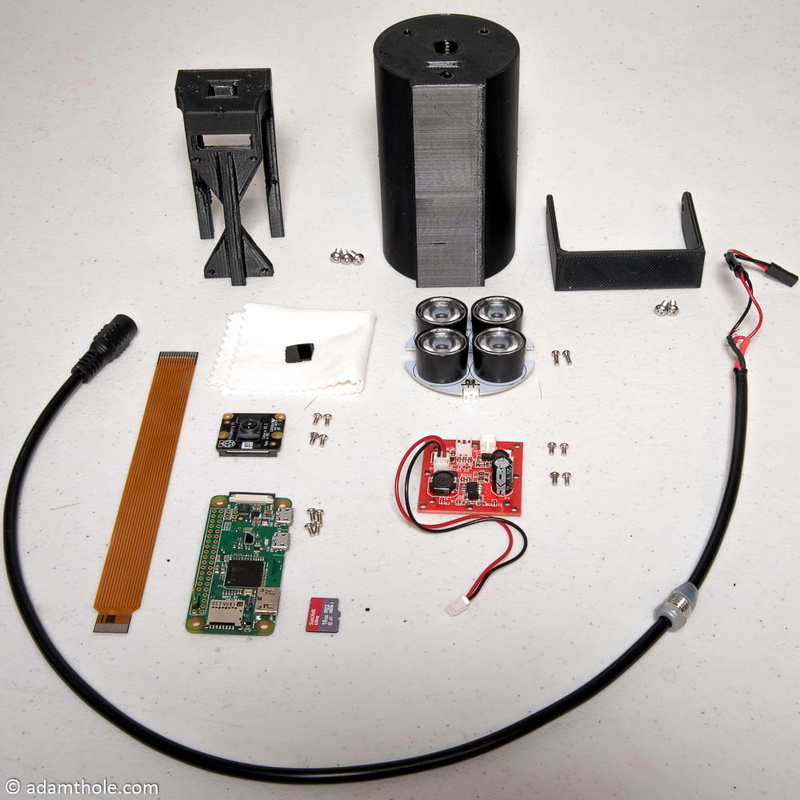 This isn’t the first DIY thermal camera build we’ve seen, and it isn’t even the first one we’ve seen that leveraged a commercially available imaging module. But short of buying a turn-key camera, we don’t see how it could get any easier to add heat vision to your bag of tricks. Who says there’s no such thing as magic? Not anyone who knows what a Unix pipe is, that’s for sure. If you do some of your best incantations at a blinking cursor, this scratch-built Raspberry Pi Zero “Spellbook” laptop created by [Calvin] might be just what the apothecary ordered. Lucky for us, he was kind enough to document the design and construction of this penguin-powered tome for anyone else who wishes to dabble in the GNU Dark Arts. In the series of videos after the break, viewers have the opportunity to watch a project go from idea to final product. The first video was uploaded nearly a month before the project was completed, and goes over some of the design elements of the project as well as different ideas [Calvin] had in terms of things like component placement. Throughout the video, he illustrates his ideas in TinkerCAD, which might not have been our first choice for a project this complex, but it does go to show what’s possible in the free web-based CAD package. By the second video, [Calvin] has printed some parts and now has the hardware coming together. The general idea is that the outside panels of the “book” are made out of steel cut from the side panel of an old computer, with the 3D printed components taking the form of spacers between the electronic components. These plastic “pages” are not only easier and faster to print than a complete case, but help sell the appearance of the book when viewed from the sides. 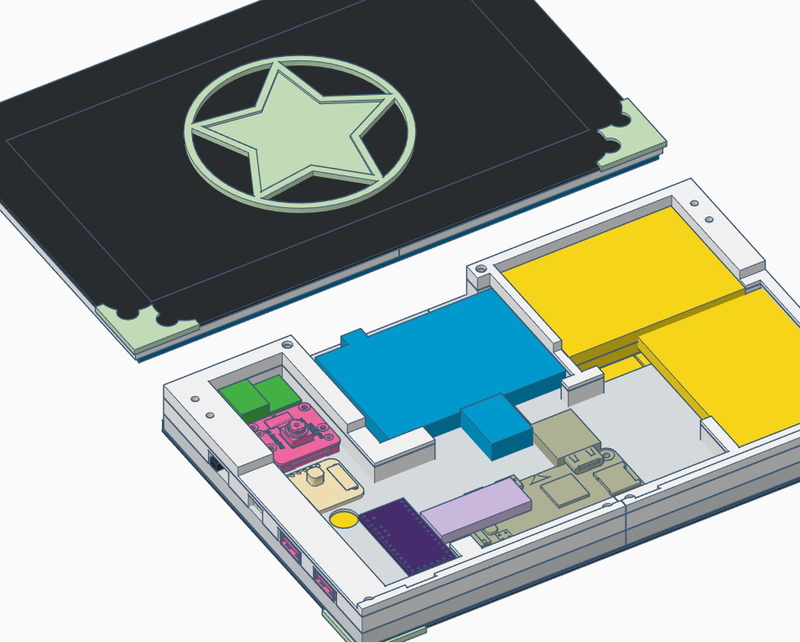 [Calvin] has shared his TinkerCAD design so that others can print out the necessary components for the book, though you’ll have to source your own steel plates. He also breaks down all the principle components he used and gives links to where you can buy them, from the display and keyboard down to the screws and standoffs. He went with the Pi Zero and sticks to mainly console work, but if you want something with enough power to throw around a graphical environment, he says there’s room in the case for a Pi 3. Hackers seem to enjoy hiding hardware inside of books, PLA or otherwise. We’ve recently seen an iPad nestled snugly into a notebook, and of course no house would be complete without a book doubling as a hidden switch. If you imagine somebody playing chess against the computer, you’ll likely be visualizing them staring at their monitor in deep thought, mouse in hand, ready to drag their digital pawn into play. That might be accurate for the folks who dabble in the occasional match during their break, but for the real chess aficionados nothing beats playing on a real board with real pieces. Of course, the tricky part is explaining the whole corporeal thing to a piece of software on your computer. Enter the “Chess Challenger” by [slash/byte]. Modeled after a commercial gadget of the same name from 1978, his retro-themed open hardware design utilizes the Raspberry Pi Zero and modern chess software to bring the vintage concept into the 21st century. With the Chess Challenger and a standard board, the player can face off in an epic battle of wits against the computer without risk of developing carpal tunnel. We can’t guarantee though that a few boards might not get flipped over in frustration. 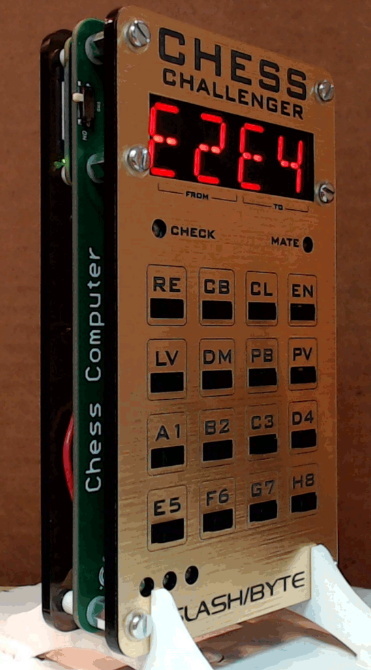 The pocket sized chess computer uses a “sandwich” style construction which shows off the internals while still keeping things reasonably protected. All of the electronics are housed on the center custom PCB which features a HT16K33 driver for the dual LTP-3784E “starburst” LED displays, a MCP1642B voltage regulator, 16 TL3305 tactile switches for the keyboard, and a MCP73871 battery management chip for the 3.7 volt lithium-ion battery that powers the whole show. The Pi Zero itself connects to the board by way of the GPIO header, and is mechanically supported by the standoffs used to hold the device together. On the software side of things, the Pi is running the mature Stockfish open source chess engine. In development now for over a decade, this GPL licensed package aims to deliver a world-class chess gameplay on everything from smartphones to desktop computers, and we’ve seen it pop up in a number of projects over the years. [slash/byte] has provided a ready to flash SD card image for the Raspberry Pi, and even provides detailed installation and setup instructions which guide you through some of the more thorny aspects of the setup such as getting the Pi running from a read-only operating system so that abrupt power cuts don’t clobber the filesystem. Over the years, some of the most impressive projects we’ve seen revolved around playing chess, and this latest entry by [slash/byte] is no exception. Another example of the lengths the chess community will go to perfect the Game of Kings.